I thoroughly enjoyed Munshi Premchand’s 1936 novel ‘Godaan’. It’s a classic for a reason, and is different in some key respects, from the 1963 film adaption discussed in my last post. Firstly, Hori is not exclusively the object of pity and frustration the film makes him out to be. His life is indeed full of hardships, and people seek to exploit him from all sides. However, it is not as unremittingly bleak and dismal as represented in the film. 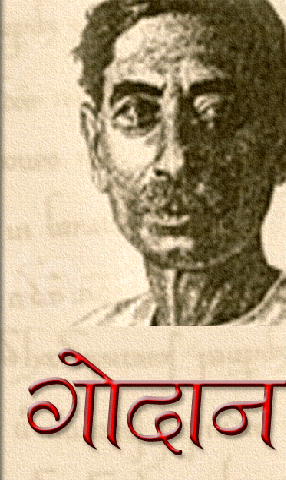 A core object of Munshi Premchand, in writing this novel, is certainly illustrating the deplorable condition of the Indian peasantry, and their wholesale exploitation by the landowners and priestly class. However, ‘Godaan’ is not a highly charged political polemic or what one may term a ‘superior op-ed piece’. It is a complex portrayal of Indian rural life in the early decades of the twentieth century. Most of the characters which inhabit the novel are complex personalities, and while the peasants may be at the receiving end of the injustice fostered by the prevailing landlord-tenant economic structure, this does not transform them into martyrs or one dimensional victims. Each character has positive and negative traits, though in the better characters the good predominates. Obviously, though, exploitative conditions and ignorance through poverty, can play a strong part in bringing out the worst in any individual. Even the exploiters, such as ‘Rai Sahab’ (the big zamindar of the village) are multifaceted. I think the last part of this passage was a particular stroke of brilliance. Rai Sahib is an intelligent and not totally inhuman person, and here he means what he says. But in continuing to play his part as the zamindar while bemoaning the ills of the system, he becomes a hypocrite. Having been the wealthiest zamindar in the locality all his life, imperious attitudes and tendencies have also, almost inevitably, crept into his demeanour. The village elders looked as though their faces had been smeared with tar, and the inspector looked as though he had been beaten with a broom. To preserve their dignity, they turned and marched off towards Hira’s house. You have to read the book, or at least read this particular chapter to really enjoy what has transpired, and it gets even better as the chapter progresses. Premchand probably got a kick out of writing it, and the reader certainly gets a kick out of reading it. Dhaniya is an incredibly feisty woman, high-strung and fiery but generous hearted. Her spiritedness does come out in the film, but in the novel she’s quite extraordinary. Jhuniya is admitted into the house, primarily because of Dhaniya. Jhuniya is the lower-caste widow with whom Gobar (the son of Hori and Dhaniya) gets involved. Learning that she is expecting his child, Gobar leads her to his home and then runs away from the village, deserting her. Hori and Dhaniya first resolve to eject Dhaniya from their home; the consequences of admitting her will be pretty serious for them. They cannot, however, go through with it. Dhaniya is consumed with pity for the girl, and the couple accept her as their daughter-in-law. For this, they are socially boycotted by members of their caste, and the village panchayat levels a large fine on them. To pay this fine, Hori has to procure further loans, and the never ending cycle of burgeoning debt thus begins. Basically, they brave a lot of censure for taking this step, and Jhuniya initially seems to appreciate what they have undergone. Even earlier on in the novel, she appears to be quite a fascinating character during her courtship with Gobar, when she chatters on about her experiences in the city. Accordingly, her subsequent actions took me by surprise. Gobar returns to the village from Lucknow (where he ran away to) a year later. He is earning good wages (much more than most people in the village) and Jhuniya proceeds to poison his mind against his parents, suggesting that they’re just after his earnings. She proposes that they leave the village, and Gobar before doing so, behaves very brutally with his parents. Later, towards the end of the novel, there is a reconciliation of sorts, but she never expresses (or even appears to feel) much remorse for her actions. In a novel which becomes quite explicitly moralising towards the end, this aspect of the couple’s relationship with their daughter-in-law seems strangely unresolved. I was reading somewhere that Premchand is at his best when drawing rural characters: their world is one with which he is intimately acquainted, and the wealthier, better educated characters have not been delineated with the same efficacy. I’m personally inclined to agree with this criticism. Miss Malti, Mr. Mehta, Mr. Khanna, and Govindi, are reasonably well-drawn but they (and the trajectories their lives take) do not sustain the same level of interest as Hori, Dhaniya, Gobar, Jhuniya, Sona or Rupa. The great turn arounds and conversions that take place in their lives, are not all that persuasively portrayed…Premchand, here, seems not to show, but merely tell. I think that Rai Saheb is the best drawn amongst the more prosperous characters. Mr. Mehta, whom Premchand has posited as a hero of sorts, is a bit of a bore at times. How does the film compare with the novel? I think the film was a worthy effort by Trilok Jetley (its director), but suffered from significant shortcomings, some of which were not really in Jetley’s power to rectify. Exciting as the film medium can be, it has limitations, and these limitations often strongly manifest themselves when it comes to screen adaptations of literary works. It is often difficult for a film to represent a character’s interiority as effectively as a novel. Indeed, a cinematic adaptation or even interpretation of a novel of the length and wide ranging expanse of “Godaan” entails the condensation of several hundred pages of narrative discourse, dialogue and the internal thought processes of the concerned protagonists into a space of two hours. It is almost at the outset destined to fail. Even if the script writer evinces insight and a high degree of selectivity as to what particular dialogue should be extracted from the novel and made to feature in the movie, time constraints dictate that much of the film must be devoted to just conveying the momentous events which inform the narrative of the novel, to the exclusion of the somewhat more subtle psychological processes underpinning the actions of the protagonists. These are general problems which attend any film adaptation of a literary work, and are the reasons why I am usually not even remotely interested in seeing movies made on books I love. Usually, I’m left feeling indignant, and deeming the film to be an insult to the original text. In the few cases where I prefer the film to the book, chances are that I didn’t consider the novel in question to be particularly good in the first place. In fairness, it’s a tough job to match the original text if it’s good. Turning specifically to Jetley’s adaptation of ‘Godaan’, I suppose my main problem was Jetley’s rather circumscribed vision for the film. Jetley’s project here, was undoubtedly, to depict the harsh realities of peasant life, the peasant’s vulnerability, and the way in which he is shamelessly exploitated by those positioned above him in the rural socio-economic structure; whether the moneylenders, the village headmen, the preists, the zamindars, the officials etc. However, in executing this vision he comes close to reducing the peasant couple (particularly Hori) to one dimensional victims, and the zamindar to an out-and-out villian. Many of the nuances, and shades of characterisation in the novel are lost in the film. Jetley has tried to address the problem of time constraints inherent in the film medium, by focusing almost exclusively on Hori’s family, and largely cutting out the well-to-do characters, Malti, Mehta, Khanna, Mirza etc. They are placed in the film more as relief to the unending misery that is portrayed as Hori and Dhaniya’s lot. Minimising the screen time they received was probably a sensible thing to do. Even so, a lot of time is inevitably devoted to just relating the key events which take place in the novel, with the richness of the text never really coming out on the screen. The actors (particularly Raaj Kumar and Kamini Kaushal) do a very good job, but they are obliged to act in accordance with the director’s vision for the film, which in this case, was somewhat limited. Even so, there are parts of the film which do touch you; Hori’s collapse in the fields, and Dhaniya’s response, Hori’s response to Ram Sevak’s proposal for Rupa, and of course the ending, where Mukesh’s vocals are also employed. The novel actually projects Rupa’s marriage with Ram Sevak in quite a different light (one which would be largely unpalatable for a modern readership). The film has also been heavily sanitised; there’s a lot of profanity in the novel…it probably would not have gotten past the censor board. As I stated earlier, Hori is not exclusively the object of pity and frustration that the film makes him out to be. He beats his wife; actually, quite a lot of wife-beating goes on in this novel, and not just amongst the peasantry. In the scene I related earlier, where the inspector is called in to investigate the death of the cow, the argument between Hori and his wife is not simply a verbal argument. He is physically beating her; hitting out at her, kicking her, and this is what brings in all the spectators. It is the last time he ever raises a hand against her, and afterwards he is shame stricken and begs her forgiveness. In reading the novel, you get the impression that wife-beating was pretty common amongst the peasantry back then. Even so, you’re a bit stunned when you read it for the first time, and are left thinking ‘Uh….and this guy is meant to be a sympathetic character?’ Undoubtedly, Jetley was thinking along these lines when he decided to leave scarcely any hint of wife-beating in the film; he want’s you to root for Hori all the way. In the novel Dhaniya isn’t one to take a blow meekly, and the fiestiness and strength with which she responds is heartening…and this is partially why I love that particular chapter; because she triumphs so strongly at the end of it, and esteem for her rises greatly in the village.